In platen press printing, there will be a physical reason for any inconsistencies you note on the printed page. Common problems include too much or too little ink, uneven inking, too little or too much or uneven pressure, or a combination of these. Taking note of what your printed page looks like and the adjustments you’ve made to achieve the results you want will streamline make ready and ease many common frustrations associated with platen press printing. First, it must be determined if the rollers are at the correct height. Using a roller gauge, test each roller on the press in the middle, and on each side to determine if they are the correct height. This is done by inserting the roller gauge with the flat side between the lowest roller and the bed of the press. When it is just beyond the roller, turn the gauge so the round side is now between the roller and the bed. Then pull the gauge up slowly. Turn it to the flat side before it touches the next roller and remove the gauge entirely. There should be a line of ink across the round part of the gauge. Ideally, that line of ink is about as wide as the thickness of a nickel. If it is wider, the rollers are too low. If it is thinner, or not there at all, then the rollers are too high. 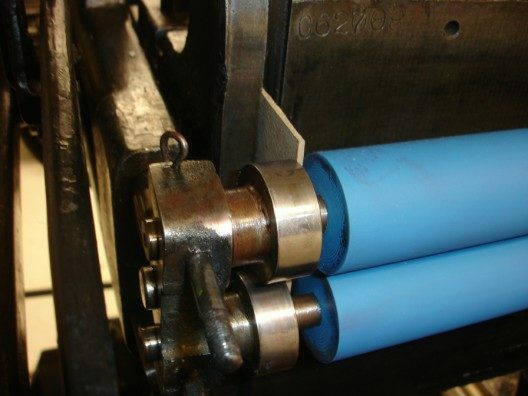 After a time, you may be able to tell the roller height without having ink on the press just by the pressure you can feel as you pull the gauge against the roller. But, in the beginning, ink will tell the story better. Do each roller in turn, working up from the bottom. Always begin with very little ink on the platen. Ink up the press with the form out of the press so that the form is not over inked as the rollers are charged with ink. When putting the ink on the ink disk, spread the ink with the ink knife all the way across the diameter of the disk. That way the ink will distribute more evenly, more quickly. If there is still too little ink as the job progresses, add a small dab of ink as if were on a clock face at about the time of 6:30 or 7:00. That way, the dab is just past the form and the rollers will spread it all around the disk before meeting the form again. The rollers may also be too high in relation to the form. This can be determined with the roller gauge. If the rollers are too high, tape, if previously applied to the rails, may be removed a piece at a time until the rollers just kiss and ink the printing surface. If the rollers are the correct height and the form is still not getting inked, it may not be perfectly type high for whatever reason. If the form is too low, a piece of tissue or thin paper may be affixed behind the image/form to raise it slightly so that the rollers engage and ink the form. Do this judiciously because it affects the impression as well as the inking. If there is too much ink appropriate for the form, remove the form from the press and try cleaning part or all of just the ink disk to see if that will remove enough ink to proceed with the job. Clean the disk thoroughly. Then with a clean, dry cloth wipe the disk with type wash to remove the excess ink. Re-ink the rollers and disk before placing the form back in the press. Take care that each time you remove the form from the press, it is placed correctly as you put it back. In other words, pay attention to where the quoins are in the chase and the guide pins are on the platen. The most probable cause of uneven inking on a platen press is a problem with the rollers. There may be a flat spot on the rollers because they were left on the ink disk. If they have rubber expansion trucks (the brand most often encountered are Morgan Expansion Trucks), the trucks may have flat spots on them because they were left resting along the rails instead of being lifted away from the rails. Or, if using metal trucks, the rails themselves have been built up or worn away and the surface is uneven. The rails themselves could be uneven, or pitted, or built up to different heights. All of these could cause the rollers to dip unevenly as they pass over the form. The best preemptive solution for uneven inking is to leave the rollers in the proper position when the press is at rest, whether just temporarily or once printing is completed. Better still is to remove them entirely after printing is complete. Rollers should always be left in the lowest possible position when the press is at rest. That means that they are at the bottom of the chase, well below the form and at the lowest part of the rails. A small piece of heavy binder’s board or wood can be placed in the space where the spring pushes the roller out so that trucks sit away from the rail. If there are metal or delryn trucks on the rollers, the rails may be built up with tape. A non-compressible tape such as UHMW (Ultra-High Molecular Weight) tape is preferred to compressible tapes such as electrical tape and masking tape. If the rollers are permitted to rest for long lengths of time on the middle of the rails which have compressible tape on them, the trucks will cause indentations on the rails, causing the rollers to skip. Therefore, always leave the press at rest with the rollers in the lowest possible position or remove the rollers entirely. Light impression is a good thing when beginning the makeready of a job. Adequate impression depends on the size of the form. If the form is small with very little type or image, or just small type, less packing will be required to get a good impression. If the form requires a lot of ink and impression to obtain good ink coverage, more packing under the tympan will be needed. It is best to start with too little impression and build up slowly so that the form and press are not damaged. Building up slowly means adding text weight paper, one sheet at a time. If the impression is punching in the paper, remove some of the packing under the tympan paper. If there seems to be one letter or one area that is printing too heavily, but the rest seems to be okay, remove the chase from the press. Check to make sure that there are no particulates or dirt on the back of the form and that the form has been planed down well. It is necessary to unlock the form and lock it up again to make sure that everything is evenly planed down. Fixing uneven impression is called “makeready” and can be accomplished in a variety of ways. Sometimes uneven printing is caused by worn letters and individual letters or groups of letters. These can be built up on the platen with small pieces of tape cut to the exact size. First, print directly on the tympan to see where the letters fall. Then cut tiny pieces of tape and place them on the tympan on the letters which need to be build up. A thin piece of paper or acetate can be taped on the top area of the tympan paper so that the paper doesn’t catch on any tape as it is fed into the press while printing. If a piece of paper is placed on top of the tympan, then a similar piece must be removed from beneath the tympan paper so that proper impression is preserved. At times, for one reason or another, one side of a form may print more or less heavily than the other. Again, print directly on the tympan paper. Also, print on a piece of text weight paper. Tear the paper along the area that needs to be built up and place the torn paper directly under the impression on the tympan paper. The reason to tear the paper rather than cut it is to give the paper a feathered edge so that the transition from paper to no paper is gradual and, therefore, not so noticeable on the printed sheet. To do this, lift the tympan bale, lift the tympan paper, then tape the torn paper in position to the back of the tympan paper. Be sure the tape does not overlap with the image area. If the paper is small and the form very close to the edge of the paper, then the guide pins might get smashed by the form. Instead of using regular guide pins, use a small pieces of stiff card stock or board and place it in position with double stick tape. These must still be outside the area of printing or they will smash the image or form. Once you are certain of the position, use another piece of cardstock or copper thin space on top of the cardstock guide to act as a tongue so that the paper doesn’t slip away while the press is running. Again, make sure it is out of the way of the printed area so nothing gets smashed. Tape it well so it doesn’t slip. The paper may stick to the rollers as the press is running because there is a lot of ink on the rollers, the paper is very soft and absorbent, or the form is large. To avoid this, use the grippers. Always make sure the grippers are outside the printing area and will not smash the guide pins or type before printing. If there is no way to hold the paper down with the grippers on the paper directly, move them further apart and spread a rubber band between them in one or two places. Make sure the bands are outside the printing area as well. For consistent registration, it is best to feed paper to a cut edge, and avoid feeding to a deckle or torn edge. If the paper has uneven edges and it is a one color run, there will be no problems with registration. However, if the paper has to go through the press more than once, then it may be necessary to figure out a way to register the paper. For small press runs, you can put small post it notes on two sides of the paper and feed those notes to the guides. For larger runs, you might have to place pins under the tympan so that they poke through and catch the paper in two places and then use those pin holes to register the paper in subsequent runs. Obviously, the press has to be run very slowly to allow for such registration.